The Peanuts Movie is set to hit theaters next week, and some of your favorite childhood characters will be making their big screen debut. Charlie Brown, Snoopy, and the gang will be coming to you in state-of-the art 3D animation in a brand new adventure that has parents and kids alike buzzing in anticipation. But what’s sure to be an entertaining afternoon at the theater for some could be far less fun for your child if he or she has a vision problem. Unfortunately, 3D effects affect people with certain vision deficiencies, causing dizzy spells, queasiness, and nausea. People with a healthy visual system see 3D effects as they are meant to be seen — popping from the screen, almost as if you can reach out and touch the characters. These effects are created by projecting two moving images simultaneously, but with different colors or polarization of colors for each image. The 3D glasses we wear allow most people to see these two overlaid moving flat images as one three dimensional moving image. When we look at a movie screen (or anything else) each of our eyes sees the object from a particular perspective. The image is processed through our visual system, and our brain does the work of taking the two separate images and combining them into one image that we see. This process is enabled by binocular vision skills. To properly see 3D effects in movies, strong binocular vision is necessary. 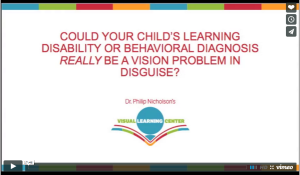 If your child has poor binocular vision with amblyopia or lazy eye, the brain and eye are not working together in a healthy correctly functioning manner. One eye may be favored by the brain while the other is suppressed. The problem encountered is that 3D glasses and the special effects may cause the brain to favor the suppressed eye, which causes a lot of strain. Your child might not see the 3D effects at all, or he may complain of headaches, dizziness, or nausea. If your child has complained during Minions or another 3D movie in past or if the complaints arise while watching the upcoming release of The Peanuts Movie, this is a sign of a possible vision problem. In fact, in many cases, uneasiness during a 3D movie is the first obvious sign that something is wrong. The same vision problem that causes headaches, dizziness, or nausea during a 3D movie will affect your child’s ability to learn as well. If you suspect your child has a vision problem, based on his or her experience while watching a 3D movie, schedule a functional vision exam with a developmental optometrist right away. Vision therapy can improve the problem significantly. If you are in Olney or Silver Spring, Maryland, contact The Visual Learning Center to make an appointment today.